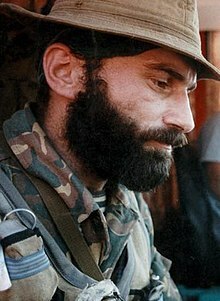 Shamil Basayev (Russian: Шамиль Салманович Басаев; 14 January 1965 - 10 July 2006) was a Muslim Chechen leader and warlord. During an attack in Ingushetia he was killed in Russia as he was planning a rush attack to Moscow in order to capture Kremlin. This page was last changed on 18 October 2017, at 11:40.